Happy New Year! We look forward to working with you in the New Year on your geothermal and hydronic applications. In 2018, we’ll continue to update the Calculators Suite based upon user feedback and better functionality. The first update of 2018 involves the Geothermal Expansion Tank Calculator. Last year we updated the Calculator based upon the Expansion Tank White Paper completed earlier in the year. 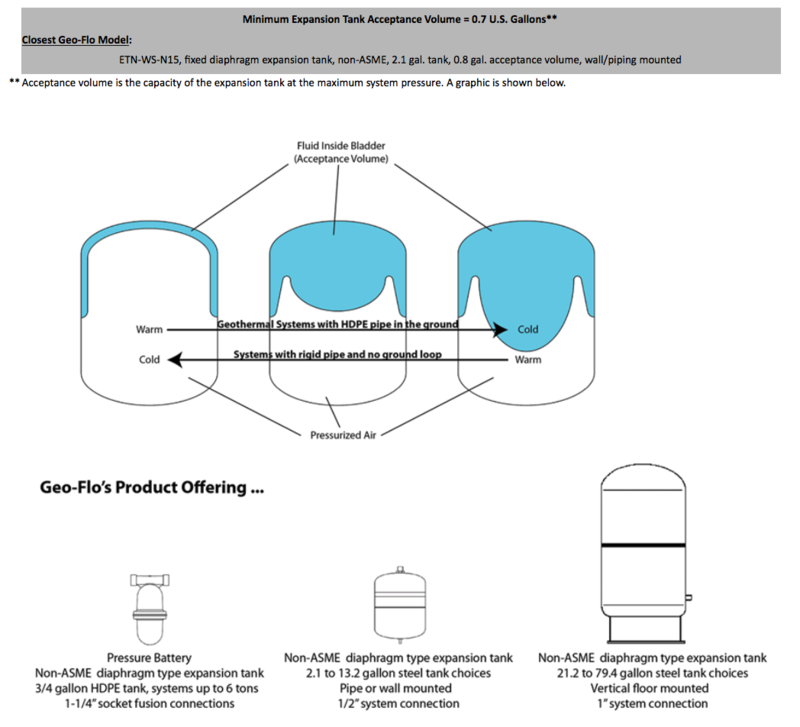 Since not all data for expansion tanks clearly show the tank volume vs. acceptance volume, the latest update in version 2.1 (click on Geothermal Expansion Tank Calculator in the Pump Sizing section) includes tank selection and Geo-Flo part number (see screen shot of output, below). The example below shows how the acceptance volume (0.7 U.S. gallons) corresponds to the tank selection (2.1 gallons, 0.8 gallons acceptance volume) at the example temperatures and pressures selected (20 to 40 psig and 40F to 90F) and percentage of HPDE pipe (99%) used in the Calculator. Check out our "How to Buy" link to find your nearest Geo-Flo sales partner. Geo-Flo will be expanding its video library in 2018. Watch for updates in this e-news! Thank you for your business in 2017. We look forward to working with you in 2018!